More than 30 games are invented for 18 years. Any games are designed with original rule and system. So even the author it is very difficult to win the game. I will try to analyze own games. I am very happy, if it will help you to understand them. This was invented in 2006. A kind of race game. King piece reachs at center tile "Kinga's Valley" is win. Rule is very simple and easy to play. This was invented in 1997. 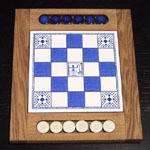 Player put or move own 6 pieces on the board. 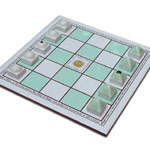 To move piece and sandwich opponent piece(s), they are flipped and make own piece(s). 4 pieces in a row is win, but strategy is very difficult.